Welcome to the Odyssey of Moontide ​and her Crew!! This site chronicles the continuing adventures of the sailing vessel Moontide, her intrepid crew, Michael and Gabrielle Dowding, and their young, clueless companion, Sophie the Tervuren Shepherd. Hover over our Restoration​ heading to see the years of effort given to return this boat to Bristol condition. Moontide is a 41-foot ketch, built in Japan in 1972 by Clare Oberly of Grand Mariner Yachts. Designed as a blue-water cruiser, she has seen the exotic south seas, travelled twice to Tahiti, and has voyaged extensively along the Pacific coast from Seattle to the Galapagos Islands. Unfortunately, neither of us were on the Moontide when all this wonderful traveling was happening! Now, it's our turn! 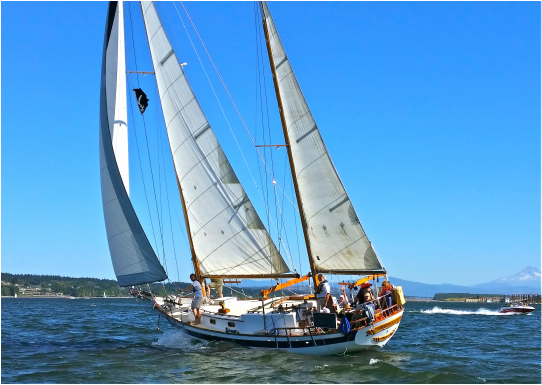 Currently, Moontide is in Oregon, completing her refit and preparing for sailing trials. Our focus is on updating her systems, cleaning out the dry rot, and restoring her to better than her original beauty. Understand that Moontide is our home. Through trials and triumphs, rending and rebuild, we love our little vessel, and enjoy this opportunity to share our experiences. If you have ever dreamed of owning a classic sailboat, ever considered casting aside the ties of this everyday world and voyaging, or ever sought to "simplify" your life and live on the water, take an armchair journey with us now and explore the peregrinations of the liveaboard!